DASA works with professional Exam Service Providers for the delivery of examinations to the market. Exam Service Providers can differentiate in how they deliver exams (like online or paper based) but have to make sure that every exam session is delivered securely and monitored by an appointed proctor. The model works as follows. Candidates either receive a voucher to take an exam from their training provider (who is a DASA Training Partner) or the provider has organized an exam session on behalf of the candidate already. In case the candidate receives a voucher to schedule an exam, the candidate contacts the Exam Service Provider (typically the voucher already indicates which Exam Service Provider) to schedule the exam session. Every exam needs to be proctored, and the proctoring rules vary per exam provider. The Training Partner in turn purchases the vouchers together with courseware from the DASA Courseware Partner. Courseware Partners purchase their vouchers from DASA. Exam Service Providers are not allowed to charge additional fees for scheduling the exam. All prices are included within the voucher. 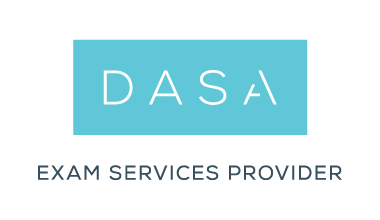 Exam Service Providers may use the DASA Exam Service Provider Logo. Will I receive a certificate if I pass my exam session? Yes, you will receive a digital certificate directly from DASA once the Exam Service Provider verifies you have passed the exam.